As mentioned in the listing, although this book was originally published in 1867, most of the receipts -- if not all of them -- are probably from before the end of the civil war. One other should also be mentioned. In the fine print on the cover, even though the author is identified as "Mrs. A.P. Hill," in the fine print underneath, it further explains "Widow of Hon. Edward Y. Hill, of Georgia" (not the widow of General A.P. Hill). Is it possible that, even then "the civil war sold." Concerning the contents, this cookbook contains the culinary receipts that would have been expected. In contrast to The Kentucky Housewife, there are very few receipts for preserving foods, especially meats, and fewer recipes for wild game. In greater number are the fancier dishes, with a chapter devoted entirely to "Fancy Dishes." 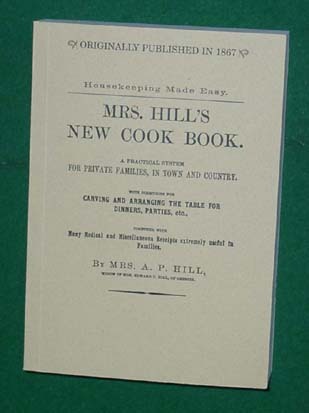 In addition to the culinary receipts, like The Kentucky Housewife , it contains receipts for care of invalids but does contain considerable more home remedies that the former book. It also contains a collection of miscellaneous receipts, most of which are for cleaning purposes or home care. Finally, of interest to anyone trying to decipher old receipts, there is a short table of weights and measures.